A few years ago, one of our Engineers, Chantelle, graduated from Portland Community College with an Associates of Arts and Sciences in Mechanical Engineering Technology. As a part of her continued efforts to help the next generation of engineers, Chantelle is still working on her 2-year term as the PCC Civil and Mechanical Engineering Technology (CMET) Advisory Committee Chair. Committee members are made up of industry professionals and PCC staff. They've been working diligently to make some changes to the program, which are expected to be implemented in January of 2019. Over the years, Chantelle stayed in touch with the CMET program and current PCC instructor, Peter Kazarinoff, who teaches Civil Engineering. He brought a few students over to the office this month for a tour. 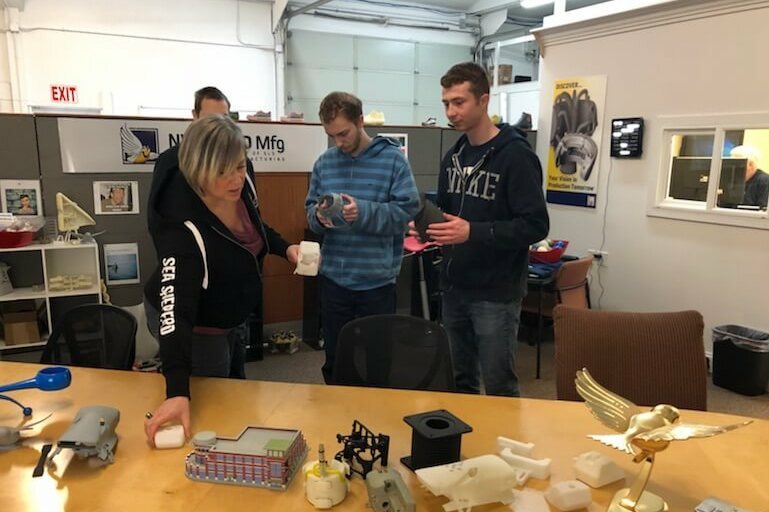 We showed them around our office, production, and second-ops buildings to introduce them to our team and an example of a day in the life of an SLS printer. First, Chantelle met the group in our conference room where we showed them some design examples. Chantelle explains the main differences between SLS, FDM, and SLA 3D printing techniques. From prototypes to usable parts, we can print (almost) anything. 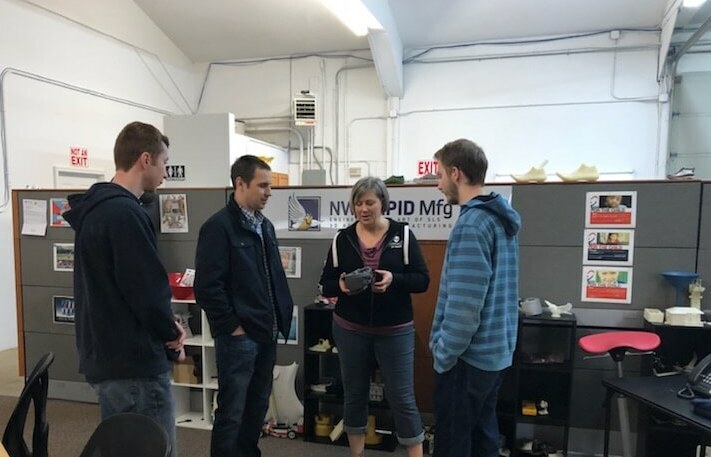 In production, we had some hands-on time with what we refer to as “cake.” Chantelle explained the printing process and what goes into ensuring parts are ready for our clients’ end use, including tensile strength testing. From there, we went over to second ops where post-production activities take place. At this stage, printed designs can get some additional love. They can be tumbled, painted, plated, and dyed before they’re shipped. We can also install inserts or tap threads to facilitate assemblies. While designs can be printed with the threads built in, plastic threads break down quickly. They're only good for a few uses, so we recommend threaded inserts for a longer-lasting screw thread. To finish our tour, we concluded where our parts usually end up before they’re sent to their new homes. Bud allowed us into his domain to showcase our shipping area where parts are prepped and shipped to clients. Sometimes delicate, we must take proper care to ensure our parts reach their final destination in one piece. We’re so encouraged to see today’s youth interested in engineering and SLS printing and we’re happy to show them what SLS can do. Do you know someone interested in pursuing a career in this field? Send them our way! Have a design you’re ready to print? Let’s talk about it!